(near the Michaels and Canadian Tire stores). Back by popular demand! 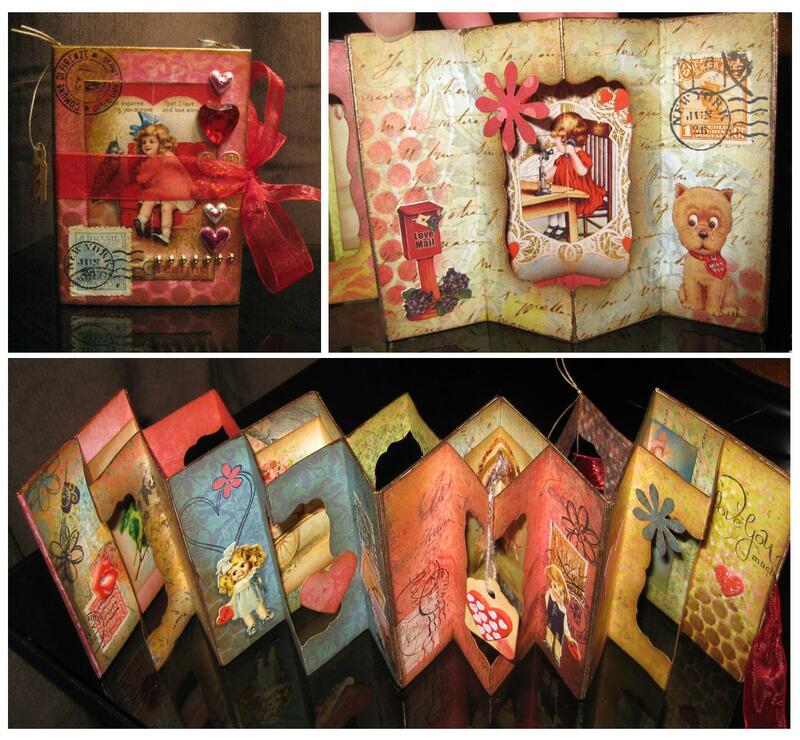 In this 2-hour class, you’ll complete an absolutely darling Vintage Valentine-themed “Peek-A-Boo Booklet” that makes a perfect gift for a loved one! Janni will walk you through the process, step by step — and will also provide most of the materials for this class. As always, participants will get a complete set of illustrated instructions. The finished booklets are 2.3 x 3.5″ in size (and about 1/2″ thick) when folded closed, but open out to show an accordion-folded set of seven mini scenes (4 on the front and 3 on the back). Janni will provide cardstock, paper, focal points, tags, punches, ribbon and bling. You provide double-sided adhesive, a good quality glue stick, and scissors. If you have blending tools and Distress ink, bring that too (Janni will have extras to share). We will use a Big Shot die cutting machine for this class — so if you’ve never used one before, this is a great way to learn! Cost: $30. Please RSVP to Pamela Hollington (pamela@pamdemonium.ca) or Janni Kretlow (janni.kretlow@hotmail.com) or reply to this blog posting.